Polymer clay must be baked in an oven and when you only have a few pieces you can easily set them on a small tray or in a pan while they’re baked. But if you have very many pieces to create or like to make beads that roll around a bit, you will quickly run out of room. This is when a polymer clay baking rack comes in handy because you can keep your beads in place and cure a lot of polymer clay in a small space. This is a review of the LC Baker, a really nifty clay baking rack from the Lucy Clay Tools. Why Use a Baking Rack? Round or irregular shaped beads can roll around as you carry your pan or tray to the oven. If the beads touch each other, they will be fused together at that point during baking. 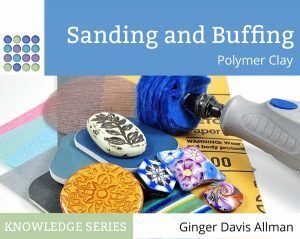 It’s far better to use a baking rack to hold the polymer clay beads, keeping them separated from each other and allowing you to make better use of the space you have. Also, when you bake beads, the part that’s touching the pan can become flat and shiny. It’s therefore better to keep beads suspended during baking. Also, if you’re using liquid polymer clay as a glaze coating, your beads will need to be suspended during baking. The Lucy Tool Company in the Czech Republic is known for making top-notch tools. I’ve previously reviewed their LC Slicer, LC Angle Base, and the Czextruder. The LC Baker is very simple, but still quite well engineered. It’s made from zinc plated steel (galvanized) that’s been pressed into two parts, a base and a lid. There are holes on the sides for bead skewers and holes on the lid for circulation. The ends are completely open as well. The sides of the LC Baker have holes in them for holding bead skewers or bead pins. There are two models of the LC Baker, one with regularly spaced holes (with 63 holes) and another with a wavy design of slots and notches (to accommodate up to 55 skewers). I do think I’d prefer the design with regularly spaced holes, though, because I found it easy to dislodge the skewers as I was loading the rack, making them slip to the next notch. The LC Baker bead baking rack. This is the wavy design variation. Note how you can cure bead on wires suspended in the rack as well as flat pieces below that. You load the LC Baker with beads on skewers in the holes and that leaves room on the bottom of the pan for flat pendants, cabochons, or other profile items. The lid protects the items underneath it from the direct heat of the oven’s element. If you use the lid, you can put more items on top of it, but the they won’t be protected from the heat. The lid of the LC Baker can act as a heat shield to protect light-colored projects from the browning under oven’s heating element. If you don’t use the lid, you can use another 19 skewers of beads across the top, nestled into the notches on either side of the LC Baker. The lid, by the way, just sets into the ledge on the top of the LC Baker. It doesn’t snap in place. You can slide it back and forth if you’d like. The LC Baker is wider at the top than it is at the bottom. The base of the LC Baker is 7 7/8″ x 5 7/8″ (200 x 150 mm) and that tapers out to a width of 7 1/4″ (185 mm) at the top. This means that the rack itself will require an oven space of 7 1/2″ x 8″ x 2″ (190 x 200 x 50 mm). If you are using skewers to hold beads, though, you’ll likely need a bit more room as the skewers will stick out beyond the sides of the LC Baker. You won’t be able to bake anything wider than 6″ (152 mm) in the LC Baker, and nothing longer than 8″ (200 mm) unless it sticks out, unsupported, at the ends of the baking rack. And if you’re using the lid as a shield, you’ll need to stick with items less than 2″ (50 mm) in height. I really do like this LC Baker baking rack from Lucy Clay Tools. If I baked a lot of beads at one time, I would certainly find this polymer clay baking rack useful. You can put a lot of clay into a small space with this rack. You can’t really fill it full with a skewer in every hole, though, because the beads would hit each other. But you really can fill it quite full. I like that it’s open to the air, which I suspect would give more even heating in convection ovens. I like that the lid acts as a shield to protect your beads from the oven’s heating element. The rack is sturdy, stable, and will last for many years. When I make beads, I use tiny bead pins from Poly-Tools. And this baker doesn’t have a way to hold that type of bead pin. There also isn’t a way to cover the beads that you put on the top rack. You could always add an inverted foil pan over the top of the baker to make a lid. Also, if you put your pendants or cabochons directly on the metal during baking, you’ll get shiny spots. So I cut some card stock to fit. Just put the clay onto the paper to bake. You can see the paper in the photo below. You can still cover the items on the top rack of the LC Baker baking rack by inverting a foil pan as a lid. I was quite surprised to find that the LC Baker didn’t come with any kind of bead pin or skewer. You could use regular bamboo skewers, but they make such large holes they’re suitable for only the largest types of beads. You could use size 0000 double-pointed knitting needles like these from Susan Bates. I ordered them on Amazon. At 8″ they do work, but are just a tiny bit shorter than I’d like. Far better, in my opinion, is to make your own from a type of wire called piano wire or music wire. You get it at the hardware store or in hobby shops. I found two shops that carried it within two miles of my house! This type or rigid steel wire does not bend easily and is often used for making springs. It comes in 36″ lengths (at least here in the US) and I found that the 0.039″ size gave just the right mix of being very tiny and still rigid enough that it wouldn’t droop when loaded with beads and placed on the LC Baker clay baking rack. Here’s where you can buy a lot for a very small price in the US. They’re quite stiff, though, so make sure that you use special tough pliers to cut them, not your jewelry pliers! I was thrilled to find that a 36″ length would cut into four 9″ pieces that were the perfect length for use with the LC Baker. If you need a sharp end, you can then use sandpaper to sharpen one end to a point. 9″ long skewers that I cut from 0.039″ piano wire that I purchased from a local hobby shop. As with all the Lucy Clay Tools, You can buy directly from the Lucy Clay Store. Click here for the EU store, and click here for the USA store. But if you prefer to deal with a supplier directly, there are partners all over the world. Not all the partners will carry a complete inventory, so you may find it better to order from Lucy Clay directly. Like I said above, I prefer to use tiny bead pins and although I received this LC Baker from Lucy Clay Tools free of charge, I really didn’t think I’d use it much. But one day in a conversation with Ed Street, he mentioned that his wife Toni Ransfield was frustrated with her current rack setup and wanted a clay baking rack that would hold more of her beautiful polymer clay covered millefiore pen tubes. Ed and Toni have been very good to me (have you seen the pen they sent me?? ), I thought I’d return the favor and sent the rack to them. Ed reports that it’s the perfect solution. Look how it’s perfect for baking Toni’s pen tubes! LC Baker rack filled with pen tubes by Toni Ransfield. Photo by Ed Street. The LC Baker is the largest bead baking rack on the market, but there are others. The Amaco Bead Rack (made by Poly-Tools) was first and it uses the tiny bead pins that I’m so fond of. I don’t really use it much, but when I am coating beads in liquid clay, it really comes in handy. It doesn’t hold very many beads, though. You can also bake cabochons and flat pieces in the bottom of the Amaco rack as well. These bead pins are tiny, they’re about the same size as a 20 gauge wire. The pins do fall out of the little notches quite easily. Cindy Lietz shows how to make a workaround with Sugru here. 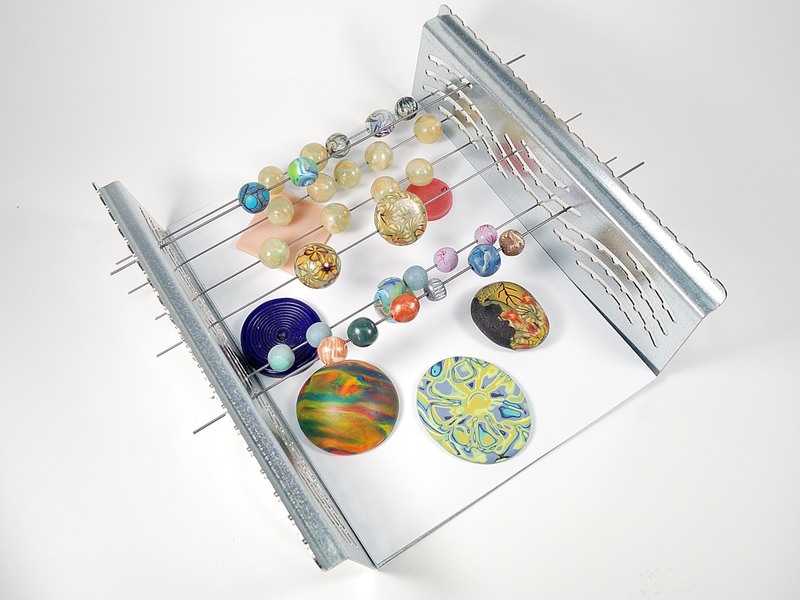 The Amaco Bead Baking Rack with bead piercing pins. Shown are my own Organic Beads and Faux Czech Glass beads. In 2014, Polyform came out with the Sculpey Bead Rack that consists of a set of oddly shaped skewers and a triangular rack to hold the ends. It’s a precarious setup and requires a flat tray to carry the beads to and from the oven. I also find the bead pins themselves to be quite thick, about the size of a toothpick, and cause a fair bit of distortion when making bead holes. But on the other hand, it doesn’t take up very much space in your studio. This is the Sculpey Bead Baking Rack. As you can see, it does hold a lot of beads, but it’s quite awkward to use. Many thanks to Jiri Strunc of Lucy Clay Tools for sending me the LC Baker so that I could review it for all of you. Also, thank you to Polyform who provided the bead baking rack. As always, please know that my opinions are my own…both the good ones and the bad ones! If you like to make beads, have you seen my polymer clay beadmaking tutorials? I have tutorials that show how to make Organic Beads, Rustic Beads, Faux Czech glass beads, and even some fun faux Roman Glass. You can see all my tutorials in my tutorials shop. Please take a moment to look them over and see if any catch your eye. As always thanks for ALL your effort and hard work! Sounds like you have a tiny space! I did update the bit about the Sculpey rack being good for small spaces. Thanks! My sculpy rack fits my toaster oven but will not fit by adding the foil pan. Can I use aluminum foil or cut ou bottom of foil pan? It doesn’t really matter what you use. You might even be able to find a foil pan that fits into your oven better. You can use foil or a base cut from a foil pan. Is that what you were asking? I have found that I prefer my own made pin holder to the tray holder as like I said I use the liquid sculpy to bond it to the tile for when I am making my own beads. I love 2-3 mm sized beads for a lot of my bead weaving and I thought I would give it a go with making my own 🙂 but they are so small I have to freeze the beads in a bead of baking soda first so I can then place the pin through them 🙂 this I have found stops them from being squished when putting the pin through so much so I am thinging of doing this step first for all my beads. Big smiles to you, Angela! I love the piano wire idea! One of the main reasons I haven’t considered the Lucy bead rack so far is the lack of bead pins, and I do love the Amaco ones. Do you find the piano wires as easy to use as the bead pins? I made two bead racks: a small one about 6 inches long and another about 12 inches long. I can use the smaller one if I don’t have many beads and still have room in my toaster oven tray for other flat pieces. I made it to fit the Amaco pins and I used Amazing Mold Putty to hold the pins in place as suggested by Cindy Leitz. I haven’t felt the need for any other bead rack, though I may make a few more for glazing with my leftover flashing. You can get the piano or music wire in a variety of thicknesses. The 0.039″ is larger than the Amaco bead pins, but you can get thinner wire that will be just like them. You will have to sharpen the ends yourself. And with the 8″ span of the bead rack, if you put beads on a thin wire, there will be some sagging with a thin wire…I don’t know how thin you could go, though. Thanks for the link to Elaine’s bead rack. Very cool DIY alternative! I can see where it would be a great solution. Lots of ways to go with this. i suppose if you are making a large quantity of beads, this is a great solution. but i went with a DIY route using a metal pan and some wires that i cut. but the fact that it does not have bead wires seems rather cheap to me. if you DO buy knitting needles, be sure that they are metal. most of the susan bates ones are plastic. there are also wooden knitting needles that are quite pricey and they have a finish on them that might not be good with PC. the piano wire seems to make the most sense and is probably most economical. The 0000 knitting needles are almost always metal because bamboo or plastic needles are too fragile when they’re that thin. I’ve knitted extensively with size 0 bamboo needles (I went through a sock knitting phase) and they’re downright bendy, even at that thickness. I think the DIY option is a great one here. There are lots of options and alternatives for sure. Interesting design, but using galvanized metal is BAD, as it’s a health hazard to heat it up. Not a good choice. I was going to ask you for information to back that up, but I decided to do some research instead. Thank you, it gave me a chance to learn something new! Welding galvanized steel can release zinc oxide, leading to something called “metal fume fever”, which is a flu-like illness that is your body’s immune response to absorbing the zinc. So there is basis for your caution. “There are some concerns with using hot dip galvanized steel in an elevated temperature environment. The industry has recommended the service temperature for conventional coatings to be less than 390 F (200 C).” Zinc oxide will be seen as a very visible gas rising from the metal, and occurs at temperatures well above the boiling point of zinc, which is around 1600°F (900°C). Since polymer clay is baked at temperatures of 300°F or lower, this is completely implausible. There is nothing dangerous about using the LC Baker in your home oven.